Virginia Tech hung tough for a little over a half, but ultimately fell to No. 12 Duke 74-52 in Cameron Indoor Stadium on Wednesday night. The Hokies dropped to 18-8 overall and 7-6 in ACC play, while the Blue Devils improved to 21-5 and 9-4. The Hokies placed just one player in double figures. That was senior wing Justin Bibbs, who scored 15 points and was 6-of-7 from the field. Justin Robinson, who played a critical role in Tech’s wins over NC State and Virginia, had just five points on 2-of-10 shooting. Robinson picked up his third personal foul with 18:59 remaining in the game, and had to go to the bench. At that point the score was 36-31 Duke, but things began to get out of hand after that. When Robinson went to the bench with his third personal foul, Duke had only been called for one team foul the entire game. Even with the disparity in fouls, the Hokies didn’t respond well to Duke’s run in the early stages of the second half. This was a close game for much of the contest, but Tech didn’t play well when they were heavily stressed by the Blue Devils. Much of that was due to Duke’s hot shooting, particularly in the latter stages of the second half. However, senior guard Grayson Allen also made clutch three-pointers while well-defended with the shot clock winding down in the first half. The Hokies were able to withstand those shots, and trailed just 36-28 at halftime. A Nickeil Alexander-Walker three-pointer cut the lead to 36-31 in Tech’s first possession of the second half, but things went downhill when Robinson picked up his third foul. Duke was without freshman phenom Marvin Bagley III, who averages a double-double, but it didn’t matter. 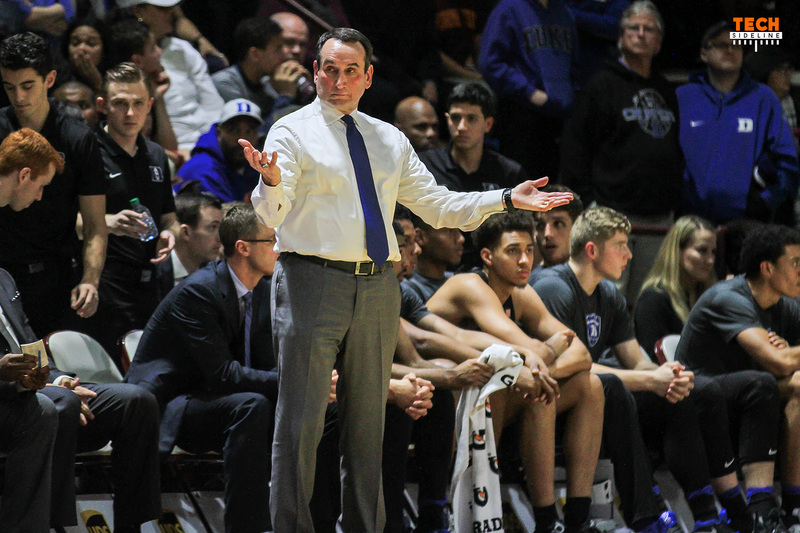 The Blue Devils still started as many as four players who could be first round picks in June, and they wore the Hokies down over the course of 40 minutes. Duke used their superior size to outrebound Tech 36-19. The Hokies only had 10 turnovers to Duke’s 13, but all the other key statistics went in favor of the Blue Devils. Besides Bibbs, there were no standout players for Virginia Tech. Kerry Blackshear finished with nine points, and led the team with four rebounds. Justin Robinson had five assists, while Nickeil Alexander-Walker had four steals, all of which came in the first eight minutes. Grayson Allen had 25 points for Duke, and he was 7-of-15 from three-point range. His seven three-pointers were a career high. The Hokies return to action on Saturday when they travel to Atlanta to face Georgia Tech. It will be Virginia Tech’s third consecutive road game. Tipoff is scheduled for noon, and the game will be televised nationally by ESPN2. Blah! Buzz is right, we can handle failure but not success. Didn’t expect to win but would have liked to play better and show some consistency. But we went 1-1 against UVA and Duke on the road. I’ll take it. Simple fact is we need to win at GT Saturday, return home and beat Clemson and Louisville. Do that and I think we are in (NCAAT) regardless of this result or the return match up with Duke. It is demoralizing when they’re making NBA+ range 3s and when they miss (and we have a couple guys underneath), they get a long offensive rebound and try again. Coach liked our D at half even with them hitting such long tough shots. I was just shaking my head sitting on the couch. What can you do? I do wish they’d put Bibbs at the FT line against the zone instead of Wilson though. It was amazing watching them dare Wilson to shoot from even 15 ft. I’m not sure if a Duke player even touched him the whole game while he was on the offensive side of the court. A good post that hits the nail right on the head! Nobody ever gets a fair shake on Dukes Home floor! I expect it will always be that way. Next game up! Go Hokies! Do you honestly think VT lost because of the officials??? #Fakenews. Well, the officiating did play a role. The 1 Duke foul at half was nuts. I counted at least 4 shoulda-been fouls. Still, we were in it at that point, and you have to expect that sort of thing is going to happen against Duke (not every time out against them, but enough of the time). When it does, the team has to keep his composure and be ready when we do start getting the calls. The team lost its composure some in the second half, got majorly sloppy. Buzz & Company need to put this one in the rear view mirror and play tough against GT on Saturday. It’s always hard to beat Duke at Duke because it’s 5 on 8 every time. That said, the McDonalds All American All-Star team won. Go Hokies!